I’ve found a whole new universe of things to print on my 3D printer. As of yesterday I was just looking on Thingiverse for things to print, but today I discovered Yeggi and Pinshape. 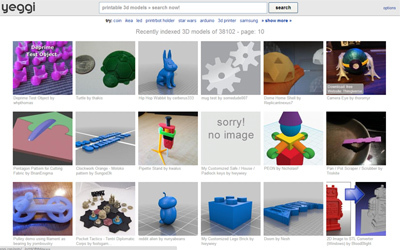 Yeggi is like a 3D model search engine. It pulls prints from sites like Thingiverse, Tinkercad, and many others, although those seem to be the two places where the models I’ve searched are coming from. Pinshape is another community like Thingiverse, although unlike Thingaverse, you need to log in to get download the models. To be fair you need to be a member of Tinkercad to download their models too.